Last updated on January 12th, 2019. 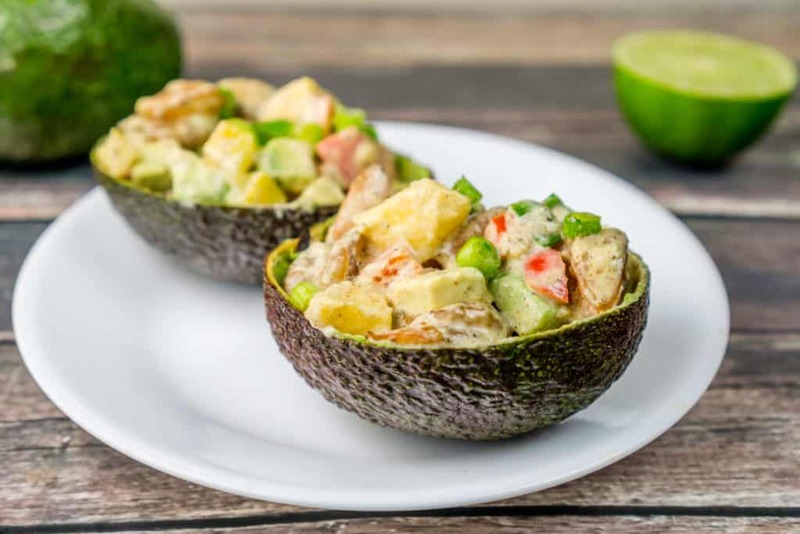 Tasty, succulent Cajun Shrimp Stuffed Avocado Boats – this easy keto shrimp and avocado recipe is a gorgeous appetizer that will impress your guests. They will be asking you to make these for every party! 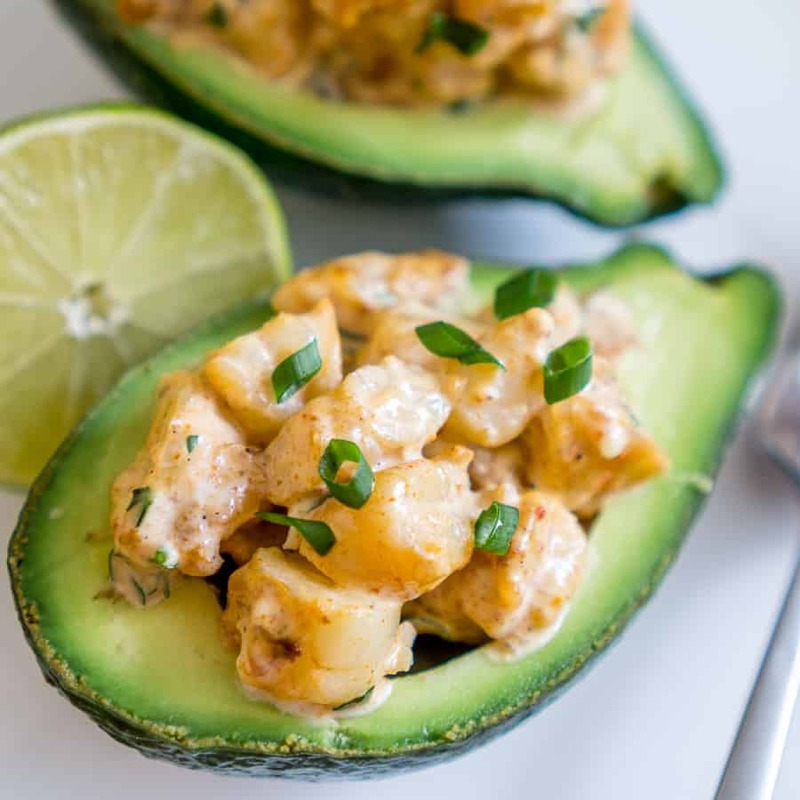 Oooh boy I am excited to share this delicious Shrimp Stuffed Avocado recipe with you! It is inspired by an appetizer I often ordered at one of the nicer restaurants around work. Is this recipe amazingly delicious? Oh yea. I mean, only if you like perfectly seasoned shrimp and deliciously creamy avocado. 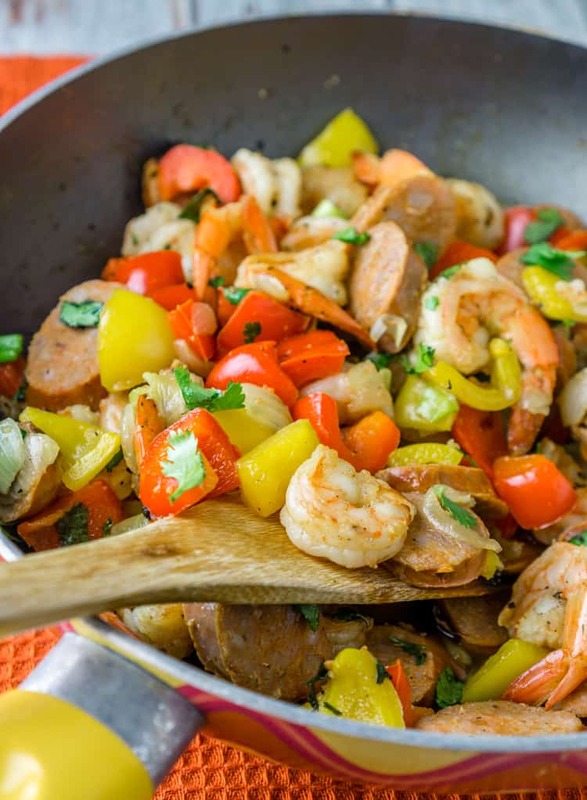 Seriously though, Cajun spice pairs so well with shrimp, it’s like a match made in heaven. And I always love adding a little creaminess to Cajun flavors. 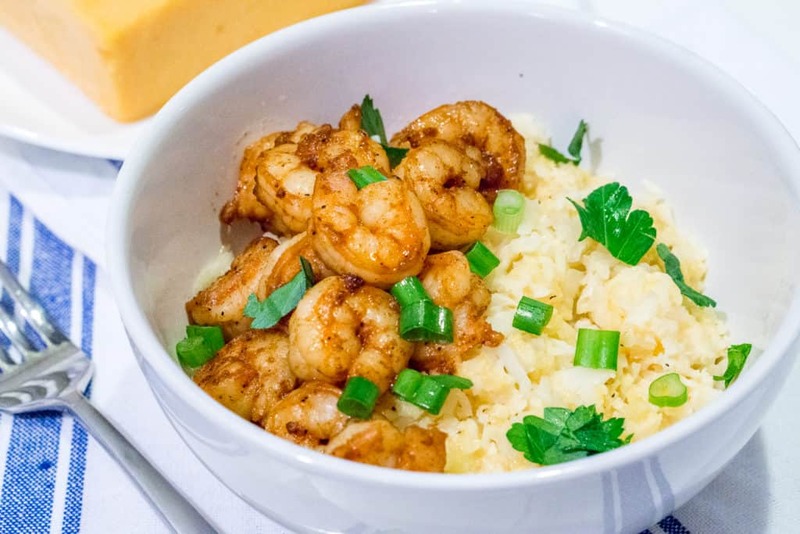 The flavor of the shrimp in this recipe is similar to Bang Bang Shrimp from Bonefish Grill without the soggy breading that happens after you coat deep fried shrimp in a dressing. Don’t get me wrong, I love bang bang shrimp! But I do like this non-soggy shrimp even better. This recipe is such a fun way to serve shrimp salad, and it always looks so damn fancy! Of course, no one has to know that this is the easiest recipe ever. Just wow them with these delicious avocado boats and say “thank you” and smile as they compliment you. You can serve these shrimp stuffed avocado boats right onto people’s plates, or you can place them on a platter in the middle of the table family-style. Just be careful if you’re gonna do that – some people might reach for seconds! Oh, you betcha!! 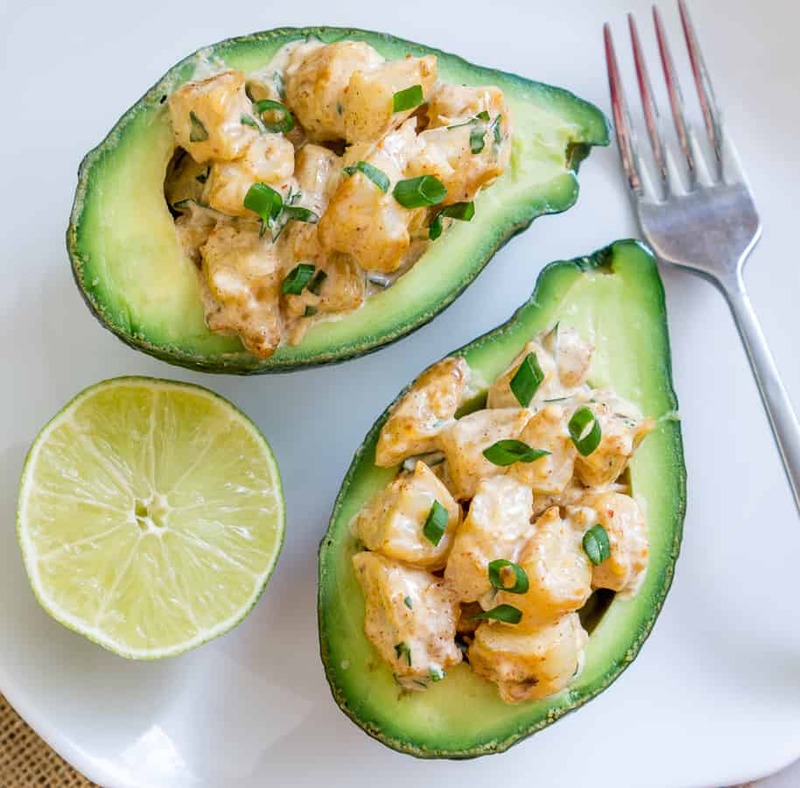 There’s lots of healthy fat from the avocado in this recipe (and some not-so-healthy fat from the mayo and the [optional] sour cream), and lots of protein from the shrimp. 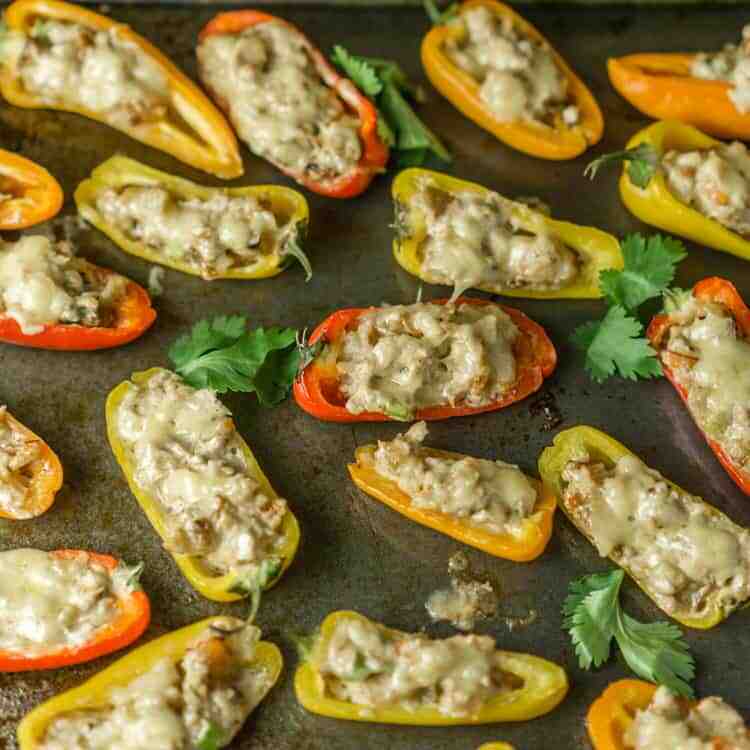 So you don’t even have to serve this as an appetizer for other people, make this as a delicious keto lunch or dinner for yourself! 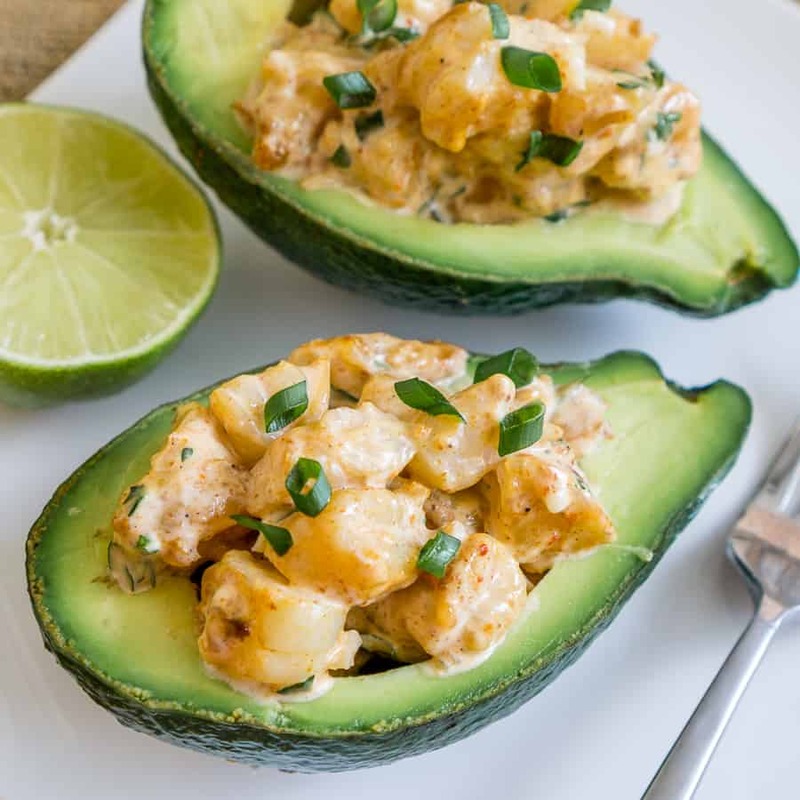 What will I need to make Cajun Shrimp Stuffed Avocado Boats? Shrimp! Obviously. Use any size shrimp you can find, since you’ll be chopping the shrimp up into little pieces. This is not the time to splurge on jumbo shrimp. I do, however, ask you to buy raw shrimp. The texture of pre-cooked shrimp is just too rubbery and not as good. Plus the flavor is never as tasty as cooking it fresh, no matter how much you try to cover it in spices. Shrimp only tastes a couple of minutes to cook and I think it’s well worth the extra work. Avocados! Another duh. I love Hass avocados because they taste so rich and creamy, but you can really use any kind of avocado you want. Cajun seasoning. I love this Cajun seasoning from Healthy Solutions because it doesn’t have added salt or any added funky preservatives. So you can control the flavor of your recipe by adding the spice and the salt separately. Plus it’s a small company that I want to support, so I always have a few packets of this seasoning on hand. It has quite a lot in it and lasts me several recipes. Lime juice. If you have limes and an extra minute, squeeze some fresh lime juice instead of using the bottled stuff. Just-squeezed lime juice tastes so much fresher. I use this citrus squeezer that makes it super easy to juice limes and lemons. Pro tip: chop up a few lime wedges and serve them with the shrimp avocado boats so everyone can squeeze some fresh lime juice over their shrimp salad. Sour cream. This is optional – I’ve made this recipe with just mayo and it is still very good. If you don’t want to buy a container of sour cream just to use two tablespoons for this recipe and then forget about it in the fridge, you can just use two extra tablespoons of mayo, or use plain Green yogurt instead of the sour cream. 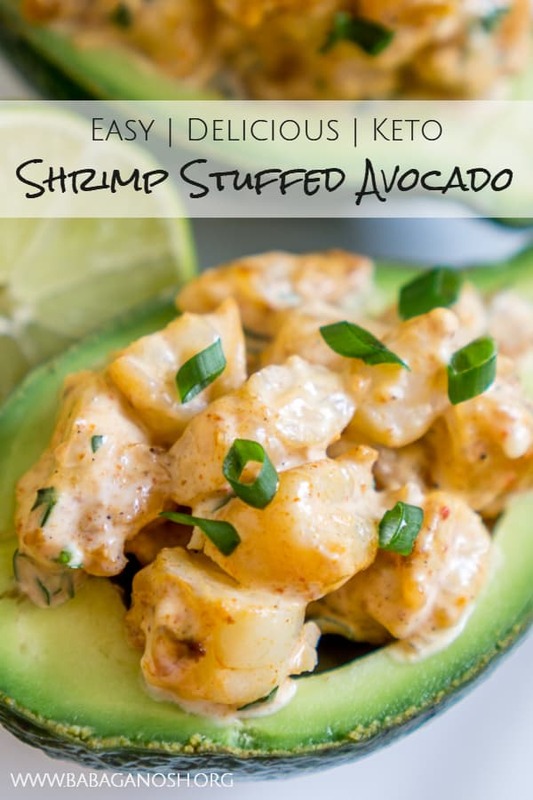 This shrimp and avocado recipe is super easy to make! Just toss the shrimp with the Cajun seasoning and salt, and cook them real quick over high heat. Once the shrimp cools a bit, chop them up roughly into small 1/2 – 3/4 inch pieces. It won’t look pretty. Don’t worry, it’ll be delicious. Stir in the rest of the ingredients to make a tasty creamy dressing, and split between four avocado halves. Garnish with fresh herbs if you want to get fancy (and you should get fancy!). If you want to feed two people, feel free to cut the ingredients in half. Buuuttttt, you should probably make the whole batch and just eat this two days in a row – it is that good! 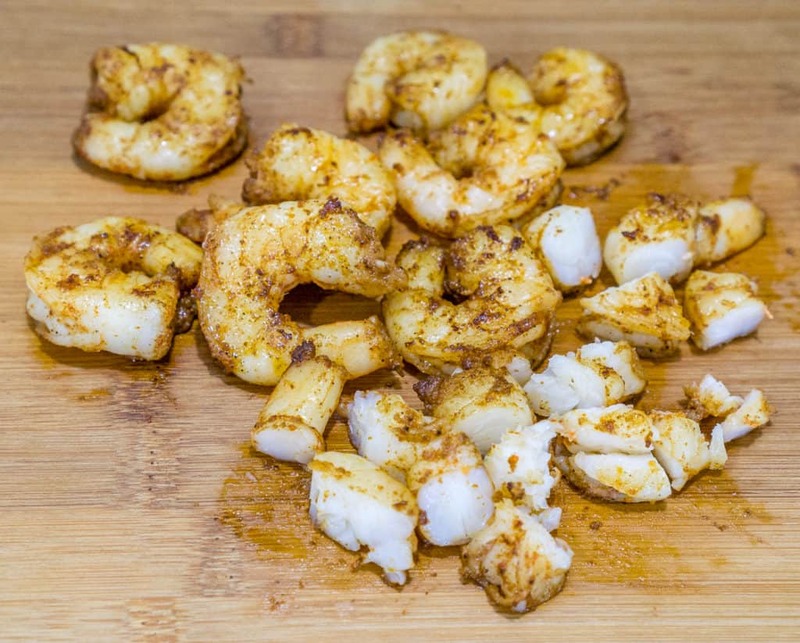 Just cook the shrimp, chop it up, and keep it refrigerated until the next day. Then when you start craving these shrimp avocado boats, just mix together the dressing with the shrimp, cut an avocado in half, and serve. Or if you want to switch things up, slice the avocado and serve it alongside the shrimp over some baby spinach. You can make the mayo-sour cream dressing and add a few splashes of water to thin it out and drizzle it over your salad. You might need an extra pinch of salt for the dressing if you’re gonna go that route. Serving a crowd? Just double or triple the recipe (that’s a no-brainer). Prepare the shrimp salad in advance, and then spoon the salad into the avocado halves right before bringing out these beauties. Tasty, succulent Cajun Shrimp Stuffed Avocado Boats - this easy keto shrimp and avocado recipe is a gorgeous appetizer that will impress your guests. They will be asking you to make these for every party! Heat the olive oil in a pan. Add shrimp and immediately season with Cajun seasoning and salt. Cook over high heat for 3-4 minutes stirring frequently. Remove from pan and set aside. When shrimp is no longer hot, cut each shrimp into 4-5 little pieces. Combine the mayo, sour cream, chopped cilantro, and lime juice in a large bowl. Add a pinch of salt and black pepper, and stir well. Add the shrimp and stir. Cut the avocados in half, and remove the pits. 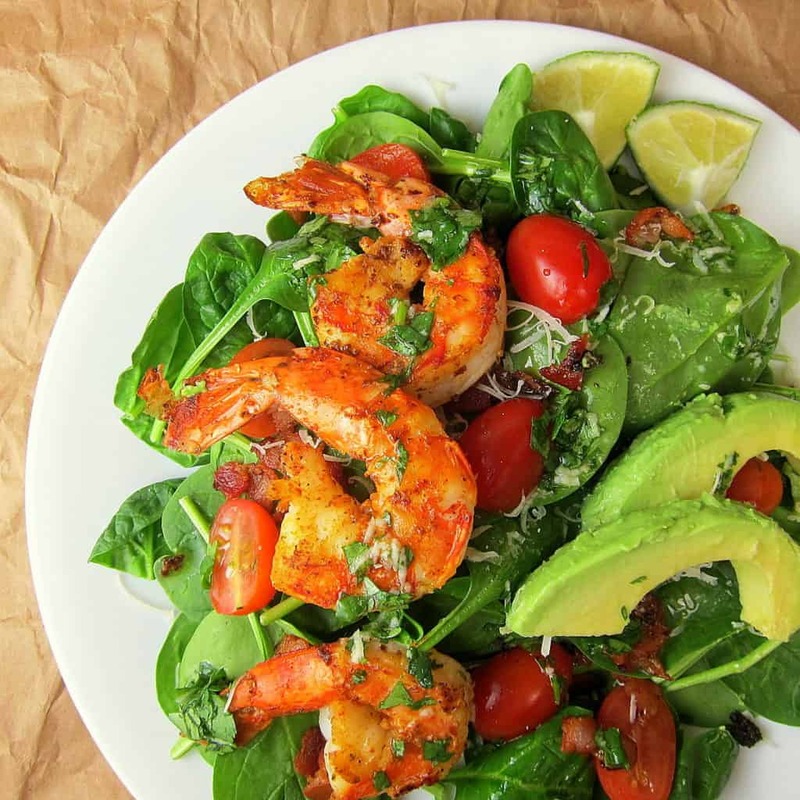 Top each avocado half with shrimp salad. Garnish with cilantro and/or scallions and serve with lime wedges. Serve immediately or chill in the fridge for 5 minutes. Cooking for two? Read the post above to see how to adjust this recipe. Thanks! The shrimp was REALLY good and really easy to make – I have to think of some other recipes that would be good with a this shrimp salad.